Caroline Woolard is a New York-based artist and organizer born in Rhode Island. She speaks internationally about art, design, technology, and economic justice. Woolard is an Assistant Professor of Sculpture at the University of Hartford, a mentor at the School of Visual Arts, and the inaugural Walentas Endowed Fellow at Moore College of Art and Design (2018-2020). She is the co-author of Being and Making: A Guide to Embodiment, Collaboration, and Circulation in the Visual Arts (Punctum Books, 2019). Recent scholarly writing on her work has been published in The Brooklyn Rail (2018); Artforum (2016); Art in America (2016); The New York Times (2016); and South Atlantic Quarterly (2015). 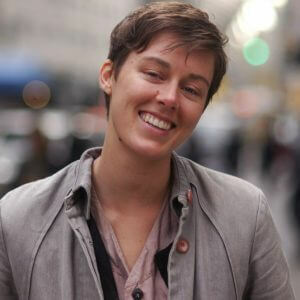 Woolard co-founded barter networks OurGoods.org and TradeSchool.coop, as well as cultural equity platform BFAMFAPhD.com, and The Study Center for Group Work to share collaborative methods created by artists. Recent projects have been commissioned by MoMA, the Whitney Museum, the Metropolitan Museum of Art, Creative Time, the Brooklyn Museum, Cornell University, and Cooper Union. Her work has been supported by numerous residencies and fellowships as well as featured twice in PBS / Art21 for ew York Close Up (2014, 2016). She has been named one of 11 Artists to Transform the Art World (2017), listed in the WIRED Smart List (2013), ArtNet’s Top 20 Female Artists (2015), and in the Top 100 Women for the Commons by the Peer to Peer Foundation (2014). Contact Caroline Woolard about speaking terms and dates.